Advancements in adaptive optics and ophthalmic imaging are facilitating the visualization of the human retina and providing researchers with an expanded understanding of eye health and disease. Advancements in adaptive optics (AO) are bringing researchers deeper into the human retina than ever before. Enabling the visualization of the living retina with cellular resolution, AO scanning laser ophthalmoscopy (AOSLO) has advanced the understanding of retinal structure in health and disease. Current-generation AOSLOs have a large footprint and are limited to imaging cooperative adult subjects. Now, a portable hand-held AOSLO (HAOSLO) system developed at Duke University, which weighs less than 200 g, allows cellular-level imaging of the human retina1. The design and computational algorithms of the system should be useful in a variety of applications in ophthalmic imaging of adults, infants, and animal models. AO was first used in astronomical telescopes to reduce wavefront distortions induced by atmospheric turbulence. 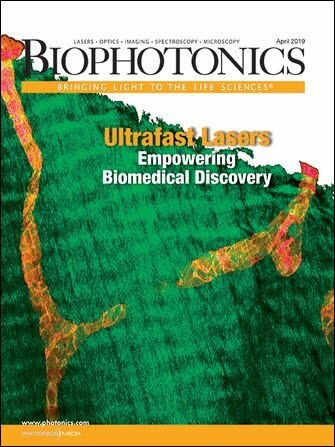 Its applications have expanded to find utility in ophthalmic imaging, high-power lasers, vision research, and microscopy. AO ophthalmic imaging systems have revolutionized the understanding of the structure, function, and neurophysiology of the visual system. AOSLO, developed in 20022, has demonstrated clinical utility for a number of retinal diseases, including Stargardt disease, retinitis pigmentosa, congenital achromatopsia, diabetic retinopathy, age-related macular degeneration, and acute macular neuroretinopathy3-9. At present, the size and complexity of AOSLO systems limit imaging to patients who are able to sit in an upright position and fixate for several minutes. Portable hand-held AO systems would be useful in acquiring high-resolution images of photoreceptors in adults and children who are supine, under anesthesia, or otherwise unable to maintain the required posture. Until now, integrating wavefront sensing and correcting AO components into SLO resulted in systems that were too large and heavy for hand-held use. The HAOSLO system was designed to provide AO-corrected SLO images of the retina with a ≥1° field of view (FOV) in a compact, hand-held format. The optics were optimized with Zemax optical design software using a human eye model; a gimbal-less, two-axis scanning MEMS mirror was used to control the position of the beam on the subject’s eye. A compact deformable mirror (DM) was used as the adaptive element to correct for wavefront distortions. Custom optical elements were designed to minimize the size of the probe, and polarization optics mitigate the effect of backreflections at the lens surfaces and maximize collection efficiency. The optical design provides diffraction-limited performance over a square FOV of 1.6° × 1.6°, providing a predicted resolution of 2.3 μm in the adult eye (Figure 1). Figure 1. Hand-held adaptive optic scanning laser ophthalmoscopy (HAOSLO) probe system schematic and optical design. Red and blue rays depict the illumination and collection paths, respectively. APD: avalanche photodiode; DM: deformable mirror; FM: fold mirror; L1–L10: lenses; LP: linear polarizer; MMF: multimode fiber; PBS: polarizing beamsplitter; PM: polarization-maintaining; QWP: quarter wave plate; SLD: superluminescent diode; SMF: single-mode fiber; VOA: variable optical attenuator. Reprinted with permission from reference 1. The mechanical design for the system, developed with SolidWorks mechanical design software, is shown with and without the outer casing (Figure 2). Custom mechanical components were designed and fabricated to accommodate the closely spaced optics of the system and to maintain a small footprint. The internal skeleton and other structural components are made of aluminum to simplify fabrication and maintain a low weight. The hand-held probe, without DM cables, weighs 199 g and is 10.3 cm long × 5.3 cm wide × 14.4 cm tall. Figure 2. Renderings of the hand-held probe’s optomechanical design; dimensions: 10.3 cm × 5.3 cm × 14.4 cm. Left cross section of the probe’s internal skeleton (a). Isometric view of the probe’s internal skeleton (b). The fabricated probe in hand (c). Reprinted with permission from reference 1. During hand-held use, the probe has the potential for considerable motion relative to the subject’s pupil. This motion alters the region of the eye’s optics that the probe’s light passes through, requiring a change in DM shape to maintain diffraction-limited performance. While wavefront sensor-based AO control can result in high-speed correction, a sensorless approach is utilized to minimize weight and optomechanical complexity, and thus facilitate hand-held operation. Existing wavefront sensorless (WS) AO algorithms are often too slow for hand-held probes. Therefore, we developed a novel stochastic Zernike gradient descent (SZGD) algorithm based on the stochastic parallel gradient descent (SPGD) method. In SZGD, the DM is primarily perturbed with a randomly selected, low-order Zernike mode and only occasionally with a random shape, while maximizing the average intensity of the collected image (Figure 3). Figure 3. Flow diagram of the stochastic Zernike gradient descent (SZGD) algorithm. First, images are 5× subsampled to increase the algorithm’s iteration speed. Next, the perturbing shape δ is determined by randomly selecting one of eight Zernike modes or a uniformly random shape in the actuator basis. All subsequent steps follow the stochastic parallel gradient descent (SPGD) technique. Prior to ending the optimization, the subsampling is removed and the image acquisition speed is restored to its preoptimization state. DM: deformable mirror. Reprinted with permission from reference 1. The MEMS-based HAOSLO system is the first hand-held AO system to enable cellular-level imaging near the fovea of the human retina. Optical aberrations are corrected without a wavefront sensor, using the fast SZGD, WS-AO algorithm. The probe in hand-held operation demonstrates robust imaging performance of photoreceptors near the fovea. This probe and computational algorithm, whether as is or with minor alterations, should be useful to optical engineers, vision scientists, and clinicians in a variety of applications for the study of ophthalmic disorders in adults and children. Derek Nankivil, Ph.D., is the staff engineer of vision products at the Center of Excellence in Research and Development at Johnson & Johnson Vision in Jacksonville, Fla. His primary objectives involve research in visual optics and psychophysics, and development of novel contact lenses; email: derek.nankivil@gmail.com. Joseph A. Izatt is the Michael J. Fitzpatrick Professor of Engineering at Duke University’s Pratt School of Engineering. He is also professor of ophthalmology and program director for biophotonics at Duke’s Fitzpatrick Institute for Photonics. He is a fellow of the American Institute for Medical and Biological Engineering, the Society of Photo-Instrumentation Engineers, the Optical Society of America, and the National Academy of Inventors; email: jizatt@duke.edu. Sina Farsiu is an associate professor of biomedical engineering, ophthalmology, computer science, and electrical and computer engineering at Duke University. He is a senior area editor of IEEE Transactions on Image Processing, associate editor of Biomedical Optics Express, and incoming associate editor of SIAM Journal on Imaging Sciences. His research interests include biomedical signal and image processing, adaptive optics imaging, and machine learning; email: sina.farsiu@duke.edu. 1. T. DuBose et al. (2018). Handheld adaptive optics scanning laser ophthalmoscope. Optica, Vol. 5, Issue 9, pp. 1027-1036. 2. A. Roorda et al. (2002). Adaptive optics scanning laser ophthalmoscopy. Opt Express, Vol. 10, Issue 9, pp. 405-412. 3. H. Song et al. (2015). Cone and rod loss in Stargardt disease revealed by adaptive optics scanning light ophthalmoscopy. JAMA Ophthal, Vol. 133, pp. 1198-1203. 4. K.E. Talcott et al. (2011). Longitudinal study of cone photoreceptors during retinal degeneration and in response to ciliary neurotrophic factor treatment. Invest Ophthalmol Vis Sci, Vol. 52, Issue 5, pp. 2219-2226. 5. M.A. Genead et al. (2011). Photoreceptor structure and function in patients with congenital achromatopsia. Invest Ophthalmol Vis Sci, Vol. 52, Issue 10, pp. 7298-7308. 6. J. Tam et al. (2011). Disruption of the retinal parafoveal capillary network in type 2 diabetes before the onset of diabetic retinopathy. Invest Ophthalmol Vis Sci, Vol. 52, Issue 12, pp. 9257-9266. 7. A. Boretsky et al. (2012). In vivo imaging of photoreceptor disruption associated with age-related macular degeneration: a pilot study. Lasers Surg Med, Vol. 44, Issue 8, pp. 603-610. 8. S.O. Hansen et al. (2013). Selective cone photoreceptor injury in acute macular neuroretinopathy. Retina, Vol. 33, Issue 8, pp. 1650-1658. 9. D. Cunefare et al. (2018). Deep learning based detection of cone photoreceptors with multimodal adaptive optics scanning light ophthalmoscope images of achromatopsia. Biomed Opt Express, Vol. 9, Issue 8, pp. 3740-3756. 10. C.A. Curcio et al. (1990). Human photoreceptor topography, J Comp Neurol, Vol. 292, pp. 497-523. In a Duke University study, the convergence time of three wavefront sensorless adaptive optics (WS-AO) algorithms was measured. Tests of the overall aberration correction ability showed that the stochastic Zernike gradient descent (SZGD) algorithm achieved the same correction quality as the stochastic parallel gradient descent (SPGD) method, but in approximately one-sixth of the time. The probe was used to image both dilated and nondilated subjects. When imaging nondilated subjects, hand-held AO ophthalmoscopy (HAOSLO) output pupil diameter was reduced from 6.11 to 4.6 mm. This was done to reliably obtain optimized images without the confounding effects of pupil vignetting on the optimization procedure. All subjects were imaged with the maximum field of view (FOV) from HAOSLO, which was 1.4° × 4.0°, at a frame rate of 6.8 Hz and image dimensions of 250 × 1464 pixels. Figure 1. HAOSLO images acquired in hand-held operation on three adult volunteers after natural dark adaptation using SZGD correction. Retinal mosaic from Subject 1 (S1) centered at a location slightly superior to the fovea. Inset (red) is located 2° from the fovea (a). Retinal mosaic from Subject 2 (S2) centered at a location slightly inferior to the fovea. Inset (green) is located 2.1° from the fovea (b). Retinal mosaic from Subject 3 (S3) centered at a location slightly inferior to the fovea. Inset (blue) is located 1.9° from the fovea (c). All insets have a 0.75° field of view (FOV). Scale bar: 0.25°. FOV of 0.75° excerpts from the three subjects encoded by the bounding box color (d,e,f). Radial power spectra of 0.25° FOV excerpts and comparison to the average histological cone spacing predicted for the corresponding eccentricities (g,h,i,j,k,l); see reference 10. S1 at 1.75° (g), S1 at 2.1° (h); S2 at 1.8° (i), S2 at 2.5° (j); S3 at 1.4° (k), S3 at 1.7° (l). Reprinted with permission from reference 1. Although this entire FOV is not expected to have diffraction-limited performance, the suboptimally aberration-corrected regions were still useful for registration and landmark identification. All images were de-warped and motion-corrected. In a first set of human experiments, the HAOSLO probe was used in hand-held mode to image seven healthy, nondilated adults positioned semireclined on a tilted chair. Results from three of these subjects are shown in Figure 1. The researchers also calculated the radial power spectra of two 0.25° FOV regions of the mosaic from each subject and compared the spectra to the cone spacing predicted from histological data. Additionally, five pharmacologically dilated, supine adults were imaged to establish the practicality of using this probe to image a subject who cannot sit upright. An image from Subject 2 after pharmacological dilation and while supine is demonstrated in Figure 2a. Finally, two pharmacologically dilated young children (ages 22 and 31 months, under anesthesia) were imaged. Figure 2b shows a single frame from the fellow eye of a 31-month-old emmetropic male patient with unilateral persistent fetal vasculature syndrome, which included congenital cataract, aphakia, and tractional/rhegmatogenous retinal detachment. In Figure 2c is the fellow eye of a 22-month-old male with unilateral Coats’ disease. Figure 2. HAOSLO images acquired in hand-held operation on dilated, supine subjects. Scale bars: 0.25°. Single cropped frame from S2 (emmetropic adult) at 2.1° eccentricity (a). Single cropped frame from fellow eye of SI1 (31-month-old) during examination under anesthesia (b). Cropped composite of five frames from fellow eye of SI2 (22-month-old) during examination under anesthesia (c). Reprinted with permission from reference 1.